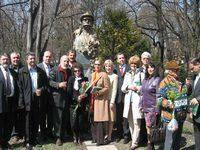 On Tsvetnitsa (the Palm Sunday according to our Eastern Orthodox tradition), the BG Minister of European Affairs, Gergana Grancharova, officially unveiled a monument to Lucien Schevalas, who was once declared “Minister of Flowers”. Gergana Grancharova was the Chairman of the Initiative Committee for the construction of the sculpture figure of the monument, done by the famous Plovdiv sculptor Tsvyatko Siromashki. The sculpture was financed by the “Small Demonstrational Projects 2004” Program, as well as by the MPs Milen Velchev, Vladomir Donchev, Plamen Mollov and the Deputy Ministers Tsonko Kirov and Valeri Tsekov.